By SUN Netra T1 105 server is a very good Application server and cluster node. 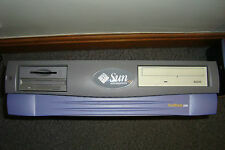 SUN Netra T1 105 UltraSPARC-IIe Server. SUN Netra T1 105, as described above. 19 "rack optimized case 1U (1U). 2 x 18GB = 36GB UltraWide SCSI Hard Disk. 2 x 450MHz / X1195A / 501-5539. 1 x 36Gb 10K SCSI. Sun Microsystems Ultra 60 Workstation. 1GB RAM ( 4 x X7004A / 8 x 501-3136. System OBP 3.31. Credit or Debit Card accepted Worldwide. All refurbished hard drives are data wiped to NCSC standards. ). 2 x 36GB SCSI HDD. 2 x 400MHz / 2MB Cache CPU. 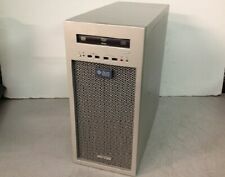 1 x Sun Microsystems Ultra 2 Workstation. 2 x X1193A 400Mhz / 2MB Cache(P/N 501-5445). Sun Ultra 2 UPA/SBus (2 X UltraSPARC-II 400MHz), No Keyboard. 1 x Emulex SBUS Singe Port Fibre Channel 2GB Network Card. By SUN Netra T1 105 server is a very good one Application server and cluster node. SUN Netra T1 105 UltraSPARC-IIe Server. SUN Netra T1 105, as described above. 19 "rack optimized case 1U (1U). 2 x 18GB = 36GB UltraWide SCSI Hard Disk. Extra Info: Dual Core AMD Opteron 180 CPU. Amount of RAM: 2 GB. Hard Drive Size: 250 GB. Model:Ultra 20. MPN Ultra 20. We do our best to fully describe the condition of each item. Service You Can Trust. Server parts. CPU heat sinks / coolers. We do not have any influence or responsibility on your national laws! Power supplies / power supplies. Minor differences in appearance do not affect, Which the function are possible. This item was manufactured for Silicon Valley Group Thermco Product Lines including Thermco, VTR7000, AVP200 and RVP 200. This item was built and tested to SVG/Thermco product specifications. MPN 5H-12-00 SUN SPARC. Model: Java Workstation W2100z Type: DDR SDRAM. Pulled working from one of my own Sun Java Workstation W2100Z's when I upgraded the RAM. Form Factor: DIMM 184-pin Capacity per Module: 2GB kit (2x1GB Modules). Capacity :- 2GB Kit (2x1GB Modules). Bandwidth :- PC2700 (PC333). This success has been built on a number of core principles :-. A huge database of information allows us to provide upgrades for almost any computer. This is a video card for a Sun workstation. It was removed from an Ultra 30, but may work in others. It has two outputs, one is the older Sun style of connector (DB13W3 - 10 pins plus 3 larger connectors) and another that looks like s-Video (mini-DIN style). Processor Type UltraSPARC IIIi. ConditionLike New. Clock Speed1.6GHz. Bandwidth :- PC133. Capacity :- 512MB Module. This success has been built on a number of core principles :-. A huge database of information allows us to provide upgrades for almost any computer. This focus has allowed us to build a knowledge base that is second to none. Capacity :- 2GB Module. This success has been built on a number of core principles :-. A huge database of information allows us to provide upgrades for almost any computer. This focus has allowed us to build a knowledge base that is second to none. Part Number X7260A. MPN X7260A. Compatible with Sun Fire x4100, x4200. Helpful Links. Bandwidth :- PC100. Capacity :- 256MB Module. This success has been built on a number of core principles :-. A huge database of information allows us to provide upgrades for almost any computer. This focus has allowed us to build a knowledge base that is second to none. MPN X7039A. Manufacturer Sun Microsystems. Compatible with Sun Servers. Raritan Trader Switch TS2. Specifications TS2. Raritan’s TraderSwitch allows users to operate a Sun Workstation and. It is designed to be. 6.5’ cable for Sun KB and mouse. 6V/500mA Adapter (DC6500U). Compatible with Sun Ultra 40 M2 Workstation. Manufacturer Third Party. Condition New Other,Tested, 100% working condition. Number of Modules 4. The PC is working, there is no HDD. Hasn't been used in a few years but was working fine previously, powers up fine, everything is in great condition. Sun Blade 150 work station, partially refurbished and not currently working. NVRAM replaced in February 2019, working correctly. No hard drive inculded. Appears to install Solaris 8 ok but on reboot after installation gives error which is too fast to read. Could well be a problem with the vintage IDE hard drive I was using. Hence could work perfectly first time if fitted with9 working IDE hard drive. Collection only as it is extremely heavy. 1 x 360MHz / X1192A / 501-5552. 1 x 36Gb 10K SCSI. 512MB RAM ( 2 x X7004A / 4 x 501-3136. 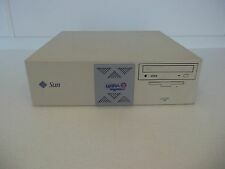 Sun Microsystems Ultra 60 Workstation. 1 x Creator Series 3 (FFB2 ) 501-4788. System OBP 3.31. 10-04-2019 12:05:52. ).